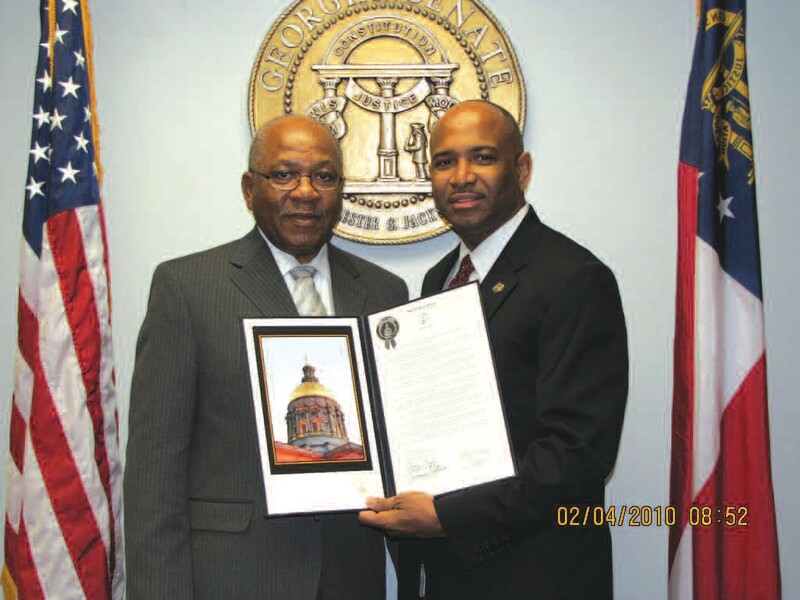 On February 4, 2010, Williams traveled to Atlanta to participate in Savannah- Chatham Day at the Capitol. Senator Lester Jackson hosted the visit with a full day of activities including a special awards ceremony with Secretary of State Brian Kemp, who presented Williams and several other deserving Savannah professionals with the Outstanding Georgia Citizen Award for outstanding achievement in their fields of profession or community service efforts. On January 4, 2010, Williams celebrated fiftyone (51) years of professional barbering service. In 1958, Williams studied barbering at the Area Trade School of Denmark, SC (now Denmark Technical College). In 1959, he began his barbering career as an Apprentice at Lampkin’s Barber Shop on West Broad Street. He worked assiduously to learn the techniques of barbering, the skills required to successfully manage a barber shop, and how to retain his clients. On January 4, 1971, Williams opened and began operating, “Jake Williams Modernistic Barber Shop,” at 1104 Montgomery Street. During the past thirty-nine (39) years, Williams has cut literally thousands of heads of hair, from elected officials and pastors, to nationally known personalities, from great-granddads to their great-grandsons. Williams is the epitome of leadership, professionalism, character, and integrity; and he continues to make a positive impact on the Savannah community. Currently, Williams takes care of his clients Wednesday through Saturday. Williams is married to Sherrie High Williams. They are members of Tremont Temple Missionary Baptist Church, where he serves as an Usher.